It seems like it’s been forever since Daredevil #31, doesn’t it? It at least does to me. Anyway, it was a real treat to see the preview of Daredevil #32, and while three pages isn’t enough to base an informed opinion on, it certainly seems like Mark Waid, Chris Samnee and the rest of the gang have managed to make a proper Halloween adventure out of this issue without it coming off as contrived. Have a look at it yourself, and see what you think! January sees the publication of three issues that should be of interest to Daredevil fans. Aside from the obvious main title – in the form of Daredevil #35 – we will also get Daredevil: Dark Nights #8, the final issue of the series. Daredevil will also make an appearance, together with the Punisher, in Superior Spider-Man Team-Up #9. The issue is written by Kevin Shinick, and has art by Marco Checchetto. The latter obviously has a lot of previous experience drawing Daredevil, and always does it really well. I think this could be a very interesting issue! Have a look at all of the Marvel comics coming out in January here. While NYCC didn’t really give us any new information on things pertaining to the Daredevil title, we did learn of two new solo titles starring characters with close ties to Daredevil. One is a Black Widow series, by Nathan Edmondson and Phil Noto, and the other is a new Elektra series by Zeb Wells and Mike Del Mundo. 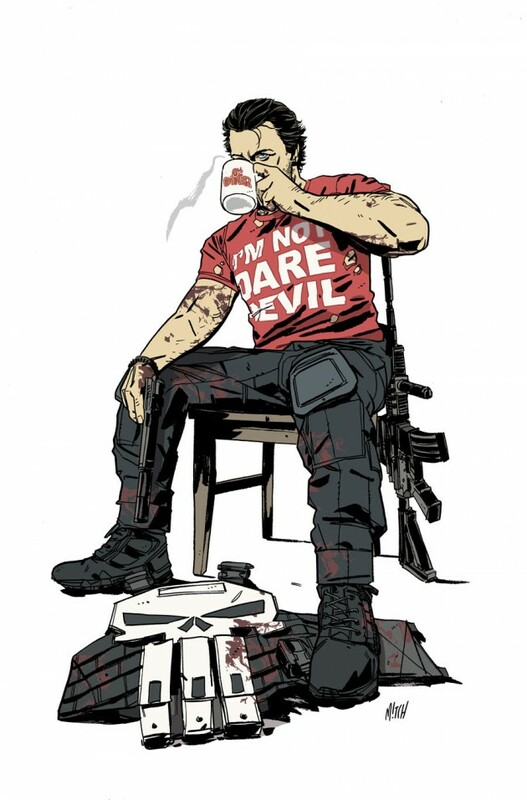 We also saw a cover of the Punisher wearing an I’m not Daredevil T-shirt (as seen below, art by Mitch Gerads). It seems everyone wants to wear that shirt. There are also some other things that I’ve been wanting to talk to you guys about, which will have to wait until tomorrow. This includes an intriguing comment made by editor Stephen Wacker in the letters page of last month’s Daredevil. There is also the information (based on an update by Diamond comics that ManWithoutFear’s Kuljit Mithra reported) that Daredevil #33 will have art by someone other than Chris Samnee (we already know that #34 will be by Javier Rodríguez) that also makes me suspect that these guys are definitely cooking up something for the next year. I hope to get back to that tomorrow while juggling being at a conference for work. I will see you then! Checchetto? :O I might actually pick this up. I wanted to pick up issue 4 (I think) because it had Luke Cage and Iron Fist, but haven’t. I really like Mitch Gerads artwork, wouldn’t mind seeing him as a guest artist on DD sometime. Not sure how long the Electra and Black Widow series will last (considering that both characters have had a lot of difficulty sustaining a title in the past) but I really would not be surprised if DD gets roped into their books at some point. Which brings up a question; With the amount of good press that the current run on DD has been getting I would not be surprised if the higher ups at Marvel try to start having Matt appear in more guest positions in other books, or event books, or even put him on another team like what was done in New Avengers, or start trying to pump out more DD books. On one hand it would be nice for DD to start getting more attention and main stream publicity, but on the other DD would start to loose his more small time cult feel and could start to become overexposed and watered down like Batman, Wolverine, or Spider-man. The question is, if this starts to happen at what point, for you, would it start to become to much? At what point does it stop being an occasional cool team up or crossover and start to be overexposed money grabs? Granted DD is not to this point, but major success and awards (like what Waid’s run is getting) at a major publisher like Marvel can be a bit of a double edged sword and I can already start to see it happening with the multiple books and the frequent crossovers or nods to the series in other books. It was just something that crossed my mind and thought I could share and get a discussion going. Its a great time to be a DD fan right now, but it would stink if DD starts appearing in 15 books a month like a certain clawed mutant. Food for thought. The guy in the taxi, doesn’t look a little like a bearded Mark Waid…? I really hope Marvel doesn’t try to overexpose Daredevil. One of the main reason Daredevil has been so great for so long is his, for the most part, isolation from the greater Marvel universe. What Mr. Waid has done with Matt interacting with Tony, Hank, Surfer, ect, has been great. His relationship with Spiderman has been really well done. All of this though I give credit to Mark Waid’s writing skills. In a lesser writer’s hands these interactions would have been ridiculous, and yeah I’ll say it, Marvel is full of lesser writers. Even Waid hasn’t been perfect. The DD/Spidey/Punisher x-over was kinda pointless. It didn’t progress the story at all and really felt like an editorial stunt. Looking back at the track record of Matt Murdock’s interaction with the greater Marvel is really disheartening. Shadowland was garbage. His “role” in AvX and pointless and out of character. Daredevil in The Avengers book was pointless other that allowing an “in” for Waid to use Avengers characters in DD. Having characters guest star in Daredevil seems to work really well in the hands of a great writer but crossovers, event stories, and team ups have been less than stellar at best and terrible at worst. I agree with your points Robert! The few times that DD has branched out in the larger Marvel U in the past five years or so have not been good, Ex: Shadowland, AvX, New Avengers, and The Omega Effect. I just really hope that that is not the direction in which they are planning to take the character in. Matt really needs to, for the most part, stay in his corner of the Marvel U with occasional guest spots, or crossovers when it furthers both characters. There is just no point for Matt to be in more then 2 books a month. Matt and The Punisher both work best when they are off doing their own thing in their own book, with their own supporting casts, with minimal to no interference from the outside. IDk just my two cents, what do you guys think? If they ever get on another movie, I can certainly see Marvel trying to push another event with Daredevil featured prominently. Very sad if it’s going to end this way. I remember how the promising Brubaker run ended somehow in a rush, although he was allways saying that he had Daredevil in store for years and years. I hope Waid and Samnee stay after the end of the volume. I would be happy with a 50 issue run or something like that. Have you seen the cover to Daredevil 36? I definitely want a poster of it.